"Shadow" is a 14 month old German Shepherd. Shadow has such a compassion nature about him. Shadow has certificates from Puppy Star Program, Good Citizen and Therapy Dog. We train with Brent Cooper from Cooperhaus Training and every week, Shadow amazes me on how smart he is, its scary sometimes. We visit Senior homes and not only do the patients find it rewarding but Shadow finds it so rewarding when everyone wants to pet and hug him. Shadow goes everywhere I do except the grocery stores, people at the Bank of America, Wells Fargo and Chase Bank, Staples Office Supplies, Lowe's, OSH, Pet Food Express, San Jose Airport, Sears, all stop to want to pet him and tell us how beautiful he is. The attached picture was taken on May 23, 2011 with my 10 month old grandson, Logan. Shadow loves for Logan to climb over him and they love to share their toys! Shadow has brought such joy and happiness to our lives! Christine, Thank you so much for sharing your great story about your German Shepherd Dog Shadow. What a wonderful story and one that I’m sure all our readers will want to read as well. And I just love the picture you’ve sent too - it shows an image that many would be afraid of confronting in their own home but German Shepherds can be very good with children if raised with them from early on. We’ve had many GSDs who loved young kids and one female in particular who would have been easily voted as “Babysitter of the Year” if she could only have performed CPR! She loved babies in particular and was soooo patient with them. And I'd like to take the time to say thanks to all our visitors for reading along with us this far. And if you get the chance, please come back often to see what else is going on in our growing German Shepherd Dog community. BTW, please tell us also exactly what you think about the above story by leaving some interesting comments below. 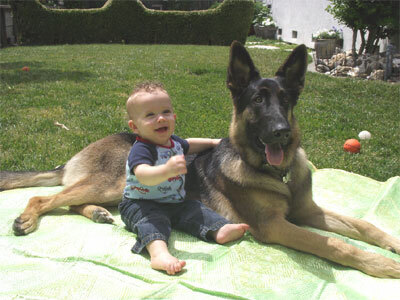 What a BEAUTIFUL German Shepherd Shadow and the baby is a cutie too! He must be a great dog and I can see why everyone would want to pet him, I would too! Being a Therapy dog, going around to meet and help people is fantastic and he probably is a big Ham taking all in when people praise him. I can see why you are so proud of your Shadow on his accomplishments!!! Take care. Christine, Shadow is a puppy. My Princess (GSD)was 17 years, 11 months and 23 days old when she was poisoned. I say this because Shadow has a lot of years left. You are blessed so take care of him. Now we have to protect our protection dogs.